Looking for good web hosting? Want a real person to get you started? 100% Wind Powered Hosting! Why not get your hosting from a local small business instead of one of those mega-hosting companies. GreenHostCo.com is just that: We're local, we're green and best of all we're affordable. If you are in the market for a solid, professionally built website you have come to the right place. We are your WordPress experts. Contact Hyperspatial Design to get started in the world of WordPress. My name is Adam J Nowak, I founded Hyperspatial Design in 2009. We are located in Fort Collins, Colorado. 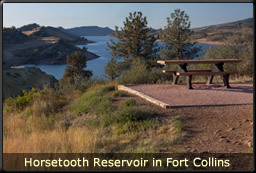 A short hike to the West of our office will take you to a ridge overlooking Horsetooth Reservoir. GreenHostCo is a Colorado born endeavor, hence the Co part. Hyperspatial Design caters to small local Colorado businesses and is actively involved in local community projects. Hyperspatial Design is a Green company. The hosting we offer is 100% Green. All of our billing and invoicing is paperless. We are environmentally conscious and are always looking for ways to improve our methods of conservation. If you are a local Colorado business looking for web development, you have come to the right place.